Workers stand together in SEIU 1021 to fight for better wages, job security, healthcare, retirement security, paid sick days, vacation and other benefits. United in our union, we’ve not only won strong contracts and enforced them but also amplified the voices of working people in our economy and society. So-called “right to work,” funded by the corporate elites and the wealthy 1%, seeks to take away our ability to join together to negotiate a fair return on our work. While these are real challenges for us, they’re not insurmountable if we hold firmly to the values that unite us: fairness, freedom, and equal opportunity for everyone to succeed, not just the wealthy 1%. This moment in our history is calling on all of us, as union members and as members of a social and economic justice movement, to stick together and use our power in numbers. 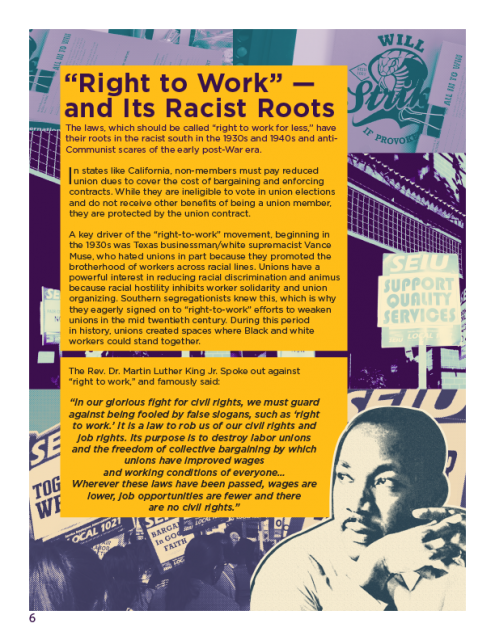 Following the Supreme Court’s decision on Janus vs AFSCME, our nation is inundated with news stories about “right to work.” Make no mistake: “right to work” has nothing to do with workers’ rights. It’s an intentionally misleading phrase. By turning unionized shops into an “open shop,” “right to work” makes it harder to band together and advocate for raises and benefits. Proponents of “right to work” laws claim that they prevent workers from being forced to unionize, but federal law already makes it illegal to force anyone to become a union member. 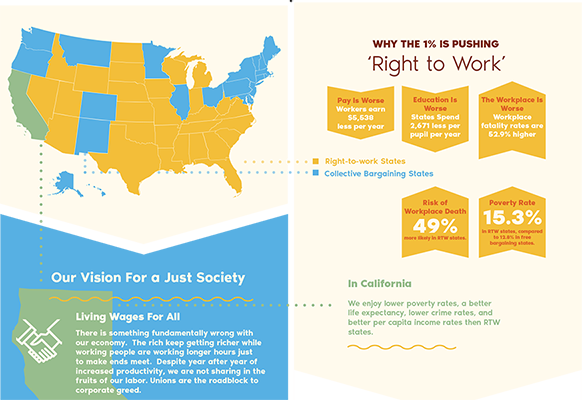 Instead, “right to work” laws tilt the balance further into the hands of bosses, and employers. They make it harder for working people to resource their organizations and leave the right to pursue common interests solely for the rich and powerful. In California, we enjoy lower poverty rates, a better life expectancy, lower crime rates, and better per capita income rates than “right to work” states. “Right to work” laws have ravaged the wages, benefits, and workplace protections for workers in states where they’ve been implemented. Standing together in our union we’ve won strong contracts, helped raise the minimum wage in our state, and defended public services for our communities. Neither the Trump Administration, the corporate-funded court case of Janus v AFSCME, nor other efforts by extremists will stop us from organizing and standing together. We are in the workplaces, in our communities, and in the streets, fighting for the rights of working families. We’re stronger together, and together we rise. 1 Economic Policy Institute, “‘Right-to-Work’ States Still Have Lower Wages,” April 2015. 2 AFL-CIO, “Death on the Job: The Toll of Neglect,” April 2012. 3 Census Bureau, POV46: Poverty Status by State: 2010, related children under 18; Table 19. Percent of Persons in Poverty, by State: 2008, 2009 and 2010. In addition to standing together with your coworkers and having a stronger voice for better wages and working conditions, being an SEIU 1021 member has its benefits. What’s the Process to Form a Union? ​SEIU Local 1021 represents public sector workers and private nonprofit workers. If your employer has a collective bargaining agreement with SEIU 1021, becoming a union member is easy. You can call our Member Resource Center at 1-877-687-1021 to become a member. If you and your coworkers are without a union at your workplace and would like to form one, contact us to get started. SEIU Local 1021 organizers will walk you through the process of forming a union if your workplace is eligible.